The final recipe in my week of recipes from the book Superfood Kitchen is Good Seed Crackers. 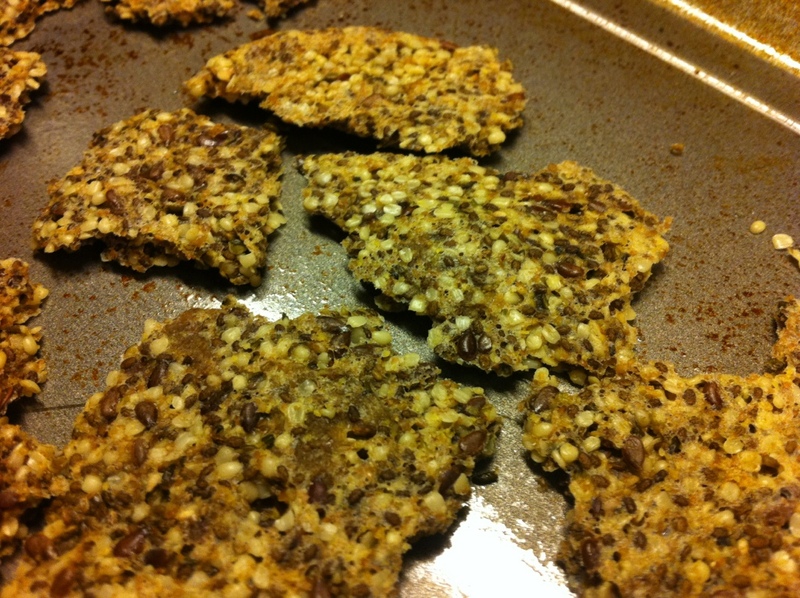 I have always wanted to try my hand at homemade crackers and since I already had the chia seed on hand from the Lemon Coconut Bars, I only needed to pick up two ingredients for this recipe, hemp seeds and whole flax seeds. 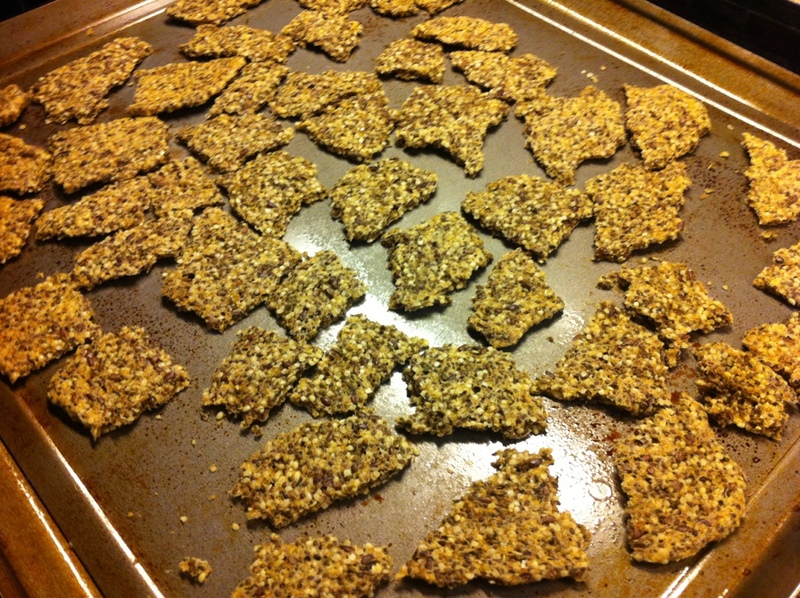 The recipe is posted online at the author’s website: Good Seed Crackers. 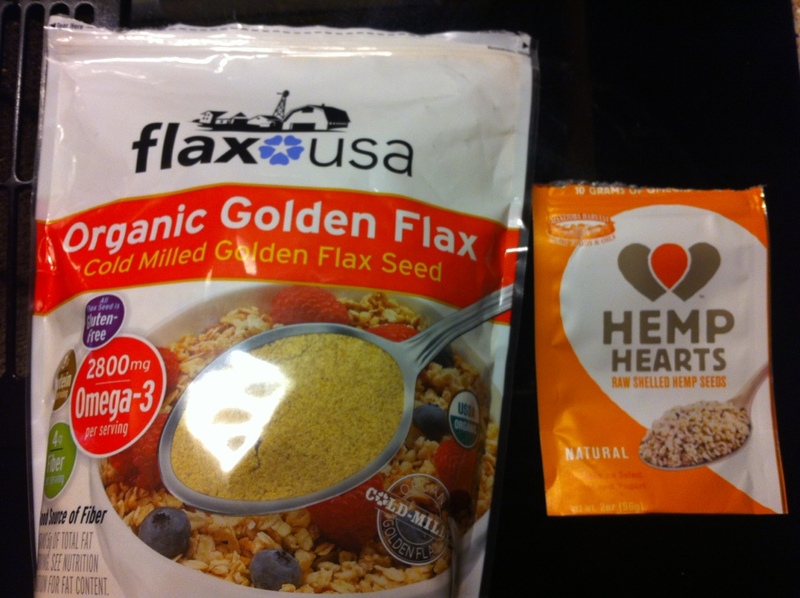 Two ingredients I wasn’t sure about were flax seed powder and the hemp seeds. For the flax seed powder I used the ground flax seed pictured below. It’s the same stuff I use to make flax eggs. Also the only thing resembling hemp seeds that was available at my local Whole Foods was the hemp hearts pictured below. I’m not sure how different they are from regular hemp seeds but they seemed to work fine. The mixture came together very quick and easy. The only thing I had trouble with was getting the crackers crispy enough. The online recipe only has dehydrating instructions but the book also gives baking instructions (250 degrees F for one hour, flip and bake 15 minutes, leave in oven with heat turned off for 30 min). I baked them for the stated time and then left them in the oven for about 4 hours with the heat off (we had to leave so I couldn’t take them out just after 30 minutes). When I came back the edges were crispy but the middle was still soggy. So I broke/tore the crackers into pieces and put them back in the oven at 250 degrees F for another 30 minutes or so, then left them in the oven with the heat off overnight. In the morning they were perfect. All pieces were crispy. Once I got them crispy enough the crackers turned out great. All three of us really enjoyed them including my toddler. The seeds were all small enough I felt comfortable giving one to him. He did just fine with it. I think we will definitely make these again and try some variations on the ingredients. The author also mentions trying these as a salad topper which I think is an excellent idea. The first three recipes I tried from this book all turned out great so that’s a pretty good sign. Overall I really enjoyed this cookbook. It has delicious-sounding recipes and beautiful photography. There are several more recipes that I want to try, including the tater tot recipe over at Chocolate Covered Katie that started this whole thing! I really liked the introductory chapters where the author explains the different superfoods and what they do. But one of the things I liked best about the book is that the author focuses on all the food you should be eating and not what you “can’t” eat. The author does address it in a few paragraphs in the FAQ section in the back but that’s about it. One downside to the book is the author uses a lot of superfood powders that you probably can’t find in your local stores. I saw a few of them at Whole Foods, but not many. And they are expensive! I know it is important to invest in your health and I fully believe that, but I still have to shop within my budget. So while I would like to try a few of them out, they probably won’t become part of my regular diet. I plan to stick to other superfoods like berries, greens, flax and quinoa. I think it’s all about figuring out what works best for you. Overall though I give it two thumbs up. Sadly I will have to return Superfood Kitchen to the library soon, but it will be going on my wishlist for sure!